Too many question right now about Windows Mobile Series 7 for me to have an opinion. The Home Screen looks really interesting, very good creative direction to create a sense of unity of information, especially compared to the mess of widgets we usually see on other customizable Home Screens. Still, the rest of the shell seems to rely on a lot of scrolling of a small window over a large landscape of User Interface actions, perhaps even too large. Some people are very good at geographical wayfinding, at remembering where something out of view is in a spatial relationship to what is in view, some are not, and this Zunerrific interface really depends on it. But my real questions are: is this really a totally new kernel? One without years of testing in the field in other phones or microwave ovens or Mars rovers? Will any phone based on this be able to take a call without resetting, something Microsoft has traditionally never gotten rock-solid right? What is the 3d party programming API and SDK here; considering Microsoft claims to have thrown everything in Windows Mobile away, is it not .NET? Will any manufacturer beyond HTC and unknown Chinese shops commit to it, considering no software customizations are allowed, and the hardware is specified? Will any operator, under these circumstances? Basically, is this software so compelling Microsoft can pull an Apple, dictating to operators what the experience will be, while not even supplying the hardware themselves? That would be interesting. Everyone seems to be so impressed by the demo hardware it is almost like Microsoft borrowed Jobs' Reality Distortion Field and the questions around it seem muted. But as hard as making a beautiful experience is on a device, that is not the hardest part of making a wonderful product. The hardest part is making the beautiful experience work, and keeping it beautiful once it has to go out into the world of people who want to play with and change it. So, why do we in the UX business interview users, distill their experiences to make user archetypes (personas) and stories about what they'd like to do with the system (scenarios) so that we can write good flows of screens (journeys)? We do this so that we have some assurance that our system will actually fulfill real people's needs. Let me give an example of where a major web store did not do the research. Seems Amazon UK now has a store for lighting, to buy lightbulbs and all. Why would anyone want to do that when there's a supermarket or hardware store or small grocer on every corner here? Might it be that users will turn to web mail-order for lighting products not sold in shops? What are these product then? Supermarkets carry energy efficient bulbs, but mostly only the cheapest ones available, which give an awful green hue to skin. I know people, including me, want better choices; I once changed the whole character of a bathroom from scary clinical to lovely just by replacing the fluorescent tube bulb the builder had used, which was, of course, the cheapest and coldest hue available, to a warmer hued one. Cost almost nothing. Impact was instant and big. So what do I want to know when I mail order a light bulb? What kind of light it gives. There are actual standards for that, that allow consumers to make an informed choice, they are Color Temperature (is the white light warmer or colder) and the Color Rendering Index (how do colors illuminated by that light look compared to sunlight). While the indices are still subject to debate and change by lighting afficionados, light bulb manufacturers know these values for every bulb; these are very specific characteristics that they try to get just right so they have lighting for every environment and occasion available to designers. Lighting manufacturers produce stacks of brochures to warn and educate users about the variety of hues of lamps. 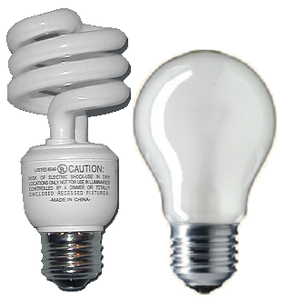 Now I am trying to find an energy saving light bulb of a specific size to fit a specific lamp that I would like to have not throw some ugly green-tinged light. And Amazon UK will happily try to sell me one, with prices ranging from £1.50 up to £50 (the latter is for LED bulbs that will last 20 years). Try to sell me one, that is, without telling me with plain, known, manufacturer-calibrated numbers, what kind of light it gives off. It's like trying to sell me clothes without even telling me the size or color. Sure, when you get the shirt you ordered home sometimes the green is sage to you and not verdigris like the page said, and XL is quite the variable these days, but at least those basic descriptions of an item were on the page. The CT and CRI values for bulbs are actually far better measured than clothing manufacturers name their colors. It's bad enough I can't filter by fitting type, or indeed filter by these color values. But not even telling me at all, and leaving this up to the sellers to put in the text description, most of which, of course, call everything 'warm white'? Somebody here did not consider what users would want to use their actual site for.